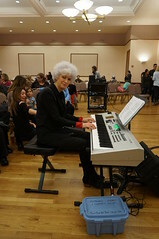 Temple Emanuel embraces the importance of music in Jewish life. 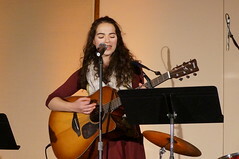 In our Conservative religious observance, we believe music elevates prayer, blending word and spirit. It provides its own language of hope and holiness to our worship. It is transcendent. 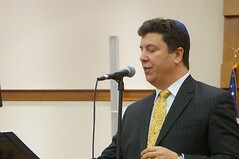 Cantor Rosemberg leads and inspires us to that special space.Music, in our view, is the soul of a community of faith. When you enter the gates of our synagogue, you find a world of song: in prayer, in learning, in teaching, and in a broad range of special events, large and small, throughout the year. With our rabbis and lay leaders, the goal of the cantor and the Music Committee is to become “the music shul,” enriching the lives of our Congregants and the larger community. Our synagogue is a place of harmony, welcoming all who enter through any of our Seven Gates. 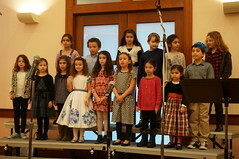 The primary purpose of the Music Committee is to support and advise the cantor, and to provide the resources he needs to develop broad musical programming at Temple Emanuel. 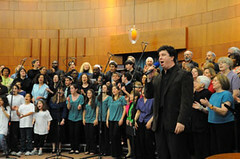 Cantor Rosemberg and the Committee work jointly in the preparation and organization of concerts and musical events. 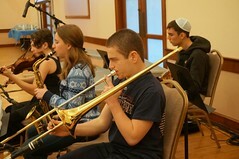 Our goal is to bring diverse music to our shul: cross-cultural, religious and secular, traditional and contemporary. In coordination with the cantor, we sometimes partner with other congregational groups to plan and produce events with a musical component. If you love music and want to help make it happen, joining the Music Committee is a wonderful opportunity to get involved in synagogue life, meet terrific people and have a lot of fun. 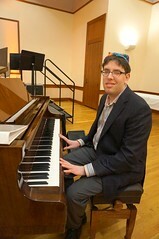 Listen to a song composed by our own Jeremiah Klarman in celebration of Temple Emanuel’s 75th Anniversary. 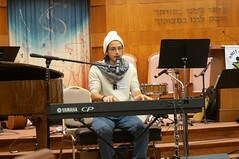 It is entitled Kol Haamim and is based on Psalm 47. View our Music brochure for the 2017/2018 year. 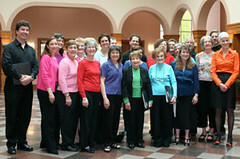 For an up-to-date listing of all Music programs, please visit our programs page. Let’s bring out the sound of the shtetl! If you like Klezmer music and play any instrument, then join us for the Klezmer music sessions. For a complete listing of all Music programs, please visit our programs page.